If each night one had the time, energy and will to look through every NBA stat line, one might be very successful at fantasy basketball. One would be able to pick up emerging studs, drop eventual duds and monitor those ify suds. Unfortunately, a manager rarely has the time to do this, but here at Fantasy Basketball Pros we care about you, so we look through all the lines and tell you in summary form what you really need to know. Here are the most telling fantasy lines from Wednesday. Let us know what you agree with or think is absolutely wrong in the comments above. I’m sure you have Mutombo on your watch list. Get him off it now. He will have no fantasy impact ever again. Averaging 9 boards, a stl and a blk a game the last 5 games. His minutes are also steadily rising. Monitor this guy. Drop this guy. The Hawks don’t trust their bench. Childress won’t get you anything the rest of the year. Don’t even come close to looking at Zaza either. The Clips are having some team troubles and it really doesn’t look like the organization wants to put Brand back on the floor this year at all, even though he’s begging to play, so keep Thomas on your watch list. I should note I personally don’t like him as a fantasy option. This guy’s been on fire the last 5 games. As stated above the Clips are having some team problems, so it’s probably a good bet to pick up the veteran guard. If you need help from the guard position, Mobley’s a great option. Don’t go near the Clippers point guards, they’ve been splitting minutes and not producing anything fantasy-wise. He can put together a decent game every once in a while, but not consistently enough. He’s one of the few players that has the undesirable designation of being a starter that isn’t fantasy-worthy. Starting to look like a very viable backup Center. Put together a very strong game against the Celtics last night, heaving up 15 shots against KG and company. Monitor him and be ready to pounce if you’re in need of a big man. Too inconsistent. Not getting the minutes like he used to last year. Don’t consider picking him up the rest of this season unless Watson goes down. In his second game with Boston, Cassell played 14 min, albeit against the lowly Sonics. Since none of the starters (including Rondo) played more than 26 minutes, it’s hard to say how many minutes Sam will get against actual competition. Monitor from a FAR, but my advice is to forget about him. A lot of people like this young guy and I do as well. Sure he didn’t have a great night against the Pistons last night, but that was a particularly low-scoring affair. Expect him to put up the above-average numbers (15 pts, 6 reb) we saw him put up last week for the rest of the season. He’s a buy in most leagues. 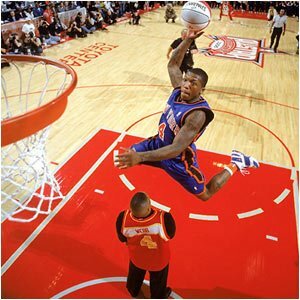 I’ll get to the point before I run off some stats: I don’t like Nate Robinson. He’s too volatile and as I’ve said before, I fear Knicks players fantasy-wise. And on to the stats: You know it’s bad when you follow up a 45 point career night with a 2-14 [5 pts] shooting night 2 days later. But that isn’t the most telling statistic for me. From a basketball fan’s perspective, I can’t believe Robinson as the starting PG for the Knicks has only averaged 3 assists the last 5 games. The Knicks are in trouble and its very clear Isiah knows this. Patrick over at Give Me The Rock correctly forecasted Cook’s game last night. But despite Daequan’s youth and inexperience at the NBA level, it’s unquestionable that the Heat have no one else to turn to at this stage of the year. Shaq is long gone. Wade is already undergoing treatment on his left knee. And Coach Riley is scouting talent for next year. I’m not saying Cook is the best option fantasy-wise, but if he continues to play 35+ minutes a game, it may even be hard for me not to be tempted to pick him up. With Ilgauskas out with a strained back and his timetable for return from injury uncertain, Varegjao seems to be a good pickup on the interior. In his last 5 games he has averaged 10 pts and 10 reb in 34 minutes a game. If he starts and gets 30+ minutes a game, I like Anderson a lot. Brown is another one of those guys that is benefiting from the injury bug. The Cavs are really banged up and he’s been getting quality minutes the last 3 games [32, 38, 38]. If you’re looking for help from beyond the arc, he’s been hitting the 3 with high accuracy. He’s also added 13 pts, 4 reb and 4 asst his last 5 games. Brown’s a more-than-suitable short-term 3pt option. Out of all the players in this post, this is the one that I have been particularly high on. I was hoping he could back from his long-term injury better than ever, but it just doesn’t look like he wants to rebound anymore. For that reason, I have to keep him on hold now. Monitor him. Has played well the last 3 games averaging 13 and 6 in only 25 minutes a game. Doesn’t look like he’ll be creeping into the starting lineup, so I’ll probably pass on him this time. Maybe next year, Bostjan? As Mike said earlier this week, don’t pick up Thomas! He hasn’t found his way into the paint much while in San Antonio and that has severely hampered his rebounding and scoring numbers. Don’t be deceived by what he did in Seattle! Pass on Kurt. Sure he can hit the 3 when Paul finds him in the corner, but other than that, Peterson’s numbers have dwindled the last 5 outings. If you still have him on your team, consider spring cleaning your roster and ridding yourself of him, there are other options out there. Look at Bell below. Drop Kyle Korver if you still have him. He hasn’t done much in Utah in his 17 minutes a game and like I said there are better 3 point options. Look at Bell below. If you’re in one of those leagues where NOBODY plays, Villanueva might be available. Chances are he’s definitely not. This guy has been sick (in the good way) the last week and a half, averaging 25 points, 10 boards, a steal and a block each game. And he shoots both the FG and the 3PTR at a very high percentages. I’ll be looking at Charlie V in next year’s draft, that’s for sure. Bell has likewise been very ill the last week. In his last 5 games he is averaging 15 points per game on 13-29 from beyond the arc. Most important his minutes are over 30 now. I think Bell is a buy right now. Gerald Wallace has returned from injury and because he’s a SF like Dudley, there have been reports that Jared’s minutes are going to be cut. That didn’t start last night, as Dudley played 31 minutes alongside Wallace off the bench. I really like this young Charlotte team, if you couldn’t already tell. My guess is Dudley will continue to produce, but in fewer minutes. Oh and Matt Carroll should be unaffected by the return of Wallace, for those that may be worried. Played 30 minutes against Charlotte last night and put up a pretty good stat line. If you are desperate for rebounds and blocks, Dampier might be the way to go, but I refused to recommend you actually pick him or Bass up. Don’t be fooled by last night’s outbreak–Kleiza is still a sell. The Nuggets blew out the Grizzlies last night and Kleiza got a few extra minutes. I think he’s a sell because not only has he been banged up recently, but he’s literally the 4th or 5th scoring option on his team. That doesn’t sit well with me as a fantasy manager. These guys all have the potential to be great talents. Just not this year. Pass for now. Sure, the Nuggets blew out the Grizzlies last night and that’s why Smith’s minutes were low, but if you’ve been reading FBP’s you know I don’t like JR. He’s been scoring a lot recently by hitting the 3 ball consistently so he’s making me look stupid, but I’ll never recommend him myself. Has been all over the place the last 5 games. Besides his below-average percentages, there is nothing he cannot do on the basketball court. Consider picking him up if you need a strong SF going into the playoffs. If a player you were interested in wasn’t covered in this analysis, let us know in the comments above. Otherwise, please don’t forget to signup for our RSS feed.